AN AUSTRALIAN-DESIGNED electric car, to be built in China, plans to take on the world with a price under $10,000, an iPad-like dash capable of downloading apps and the promise of never needing liquid fuel. The Noddy-like EDay hatch, set to debut at July's Melbourne motor show, will arrive next year as 100 lease vehicles, before going on sale in 2012 from $9990 (plus on-road costs). This undercuts petrol-powered competitors by thousands of dollars and is about 14 per cent of the price of the only mass-produced electric car on sale today, Mitsubishi's i-MiEV. The car, able to travel up to 160 kilometres between charges, has a top speed of just 80km/h and weighs 450 kilograms. It will be the slowest and lightest new car on the market - and the cheapest, something sure to cement its appeal in a segment where shaving a few hundred dollars can boost sales. The top-secret project is being run by EDay Life, a small Australian company run by former Holden director of innovation and advanced engineering Laurie Sparke and car dealer Robert Lane. They have formed a team of 20 engineers and are finalising plans to sell the cars in countries as diverse as Malaysia, Hong Kong, Britain and France. While the prospect of a start-up taking on the established car makers may seem overly ambitious, Mr Sparke said the size, flexibility and clean-sheet approach had advantages. Just as fledgling brand Tesla had prompted others to take notice - Toyota has since signed an agreement with the Californian electric car specialist - Mr Sparke predicted a rise of next-generation vehicle makers driven from the IT industry, pointing to the Dell computers business model of lean manufacturing. He said the new approach allowed engineering flexibility, while Australian ingenuity - often leveraged by US giants Ford and General Motors - and EDay's minuscule size gave it an advantage over established players. The EDay will also get a touchscreen display to control major functions and the ability to download apps that could include everything from basic vehicle data to vehicle-to-home communications. 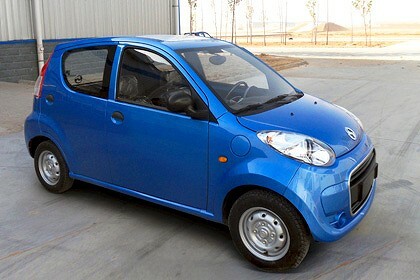 With production set for a Shanghai plant, with initial capacity of 50,000, EDay plans to sell the cars around the world. Please note that the only electric car available for purchase in Australia today is the Tesla. The iMiev is not for sale as yet.